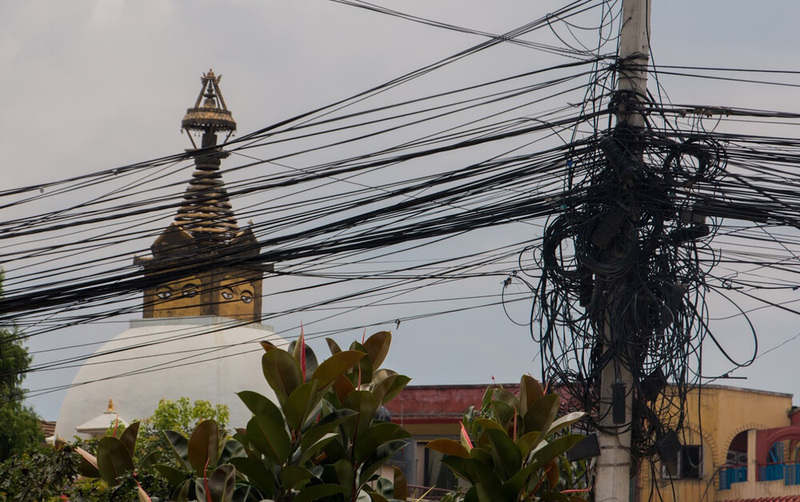 The jumble of wires above Kathmandu’s streets may be an eyesore for residents, but they have become the city’s latest tourist attraction. Instead of temple landmarks, visitors seem more intrigued by monkeys clambering on overhead wires above Kathmandu’s intersections. However, the tangle of transmission lines, phone wires, fibreoptic and TV cables that wrap the city in giant black spider webs have become dangerous because they are too heavy for the flimsy poles. Several maintenance crew members have been electrocuted in the past two years, and there have been a rash of fires that could easily have gone out of control. 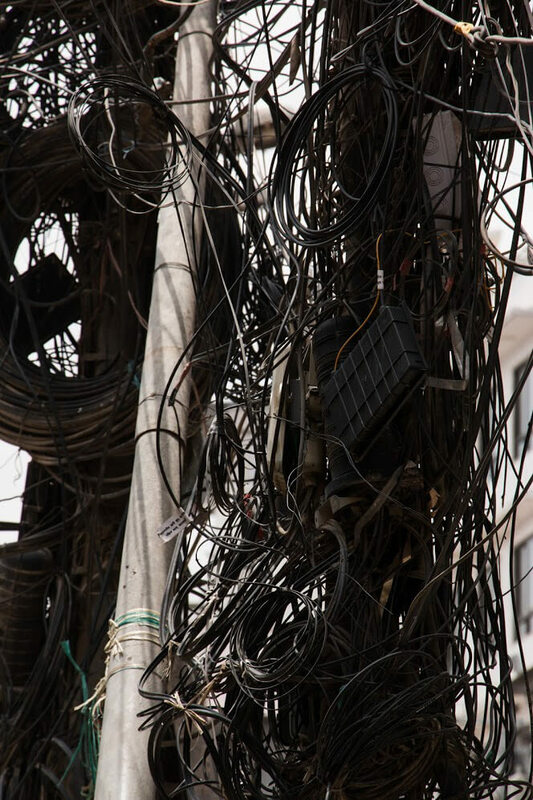 The wires are so knotted up that repair teams often give up trying fix problems. But just like potholes, polluted air and crumbling sidewalks, residents of the capital have given up expecting the elected city government to solve the problem. Till now. This week, the government suddenly realised just how scruffy the city looked, and the Municpality sprang into action to streamline the wires and pave roads that have turned into muddy rivers this monsoon. The reason for repairs on a war-footing is not public pressure, but the need to spruce up the streets ahead of the Bay of Bengal Initiative for Multi-Sectoral Technical and Economic Cooperation (BIMSTEC) Summit later this month when the leaders of Bangladesh, Bhutan, India, Myanmar Nepal, Sri Lanka and Thailand will descend on Kathmandu. The stretch of roads from the airport to Soaltee Hotel, and to the Hyatt Regency are getting facelifts, and unruly overhead wires are being tamed. Because the leaders of Buddhist countries like Burma, Sri Lanka and Thailand may also decide to visit Baudhha, the electricity poles along the road to the temple are also being cleaned up. 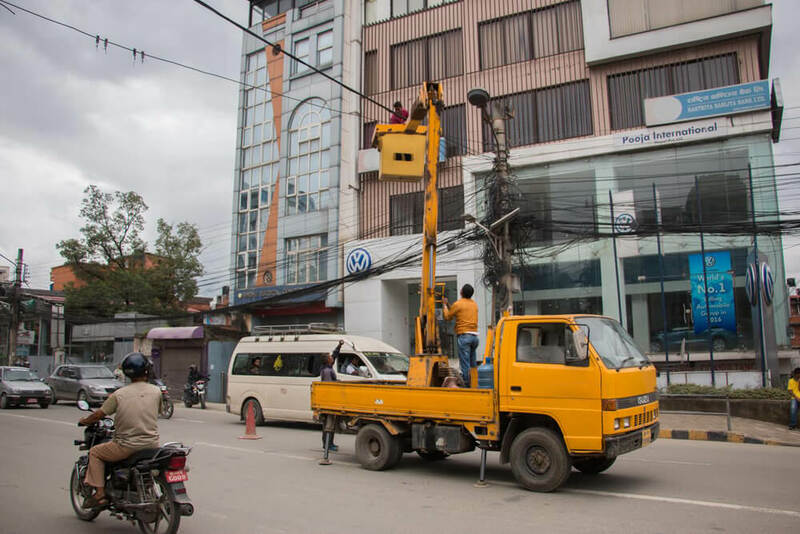 “What to do, we have to impress the important guests,” said one supervisor, as his team tied wires into neat bundles atop a ladder at Chabahil intersection this week. 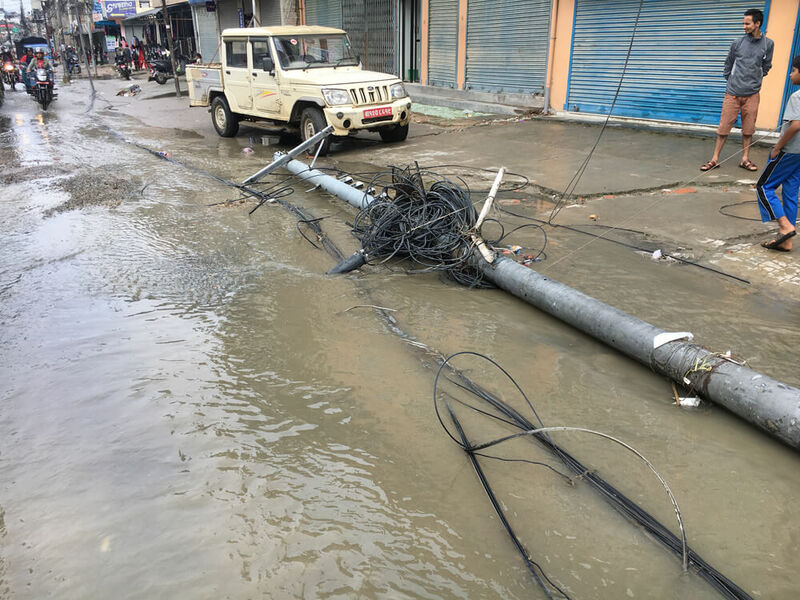 The poles are mostly owned by the Nepal Electricity Authority (NEA) which has a nominal charge for vendors who want to rent it. However, there is no regulation and no monitoring of who is actually hanging wires along the pylons. Last week, in a belated attempt to control the situation, the NEA announced a hefty tenfold increase in fees for those who want to rent poles to pull wires. Currently, ISPs pay Rs205 per year per pole. The new tariffs will calculate rental depending on per km distance, and the width of the wire used. Even though they lobbied for regulation, the association of internet service providers (ISPs) and cable operators say the price increase is too much. ISPs that pay Rs2.5 million will be paying Rs25 million with the new tariffs. The problem has been complicated because the NEA’s poles are under the jurisdiction of the Energy Ministry, whereas the ISPs and cable operators come under the Communication Ministry. ISPs recently agreed with Communication Minister Mahesh Banskota to absorb the government’s recent internet tax hike in return for a promise not to increase other fees. 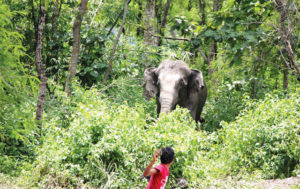 For its part, NEA blames private internet and cable companies for putting up wires haphazardly without permits, and has forced them to help with cleaning up the mess before BIMSTEC. The NEA is negotiating with the Asian Development Bank to take wires underground, but costs are prohibitive. Even NEA’s own engineer Laxmikeshar Aganja says underground wiring is not suitable for a city in which there are so many private buildings. “It is very costly to take cables underground, it takes a long time, and can be dangerous with all the haphazard digging that goes on here,” Aganja said. Cities in Japan and Korea, where power utilities have to service private urban households have overhead wires, but they are strictly regulated. If it is any consolation to Kathmandu residents, overhead wires in parts of Bangkok and Dhaka are even more unsightly. Raising the price of pole rentals alone will not be the answer. ISPs and cable operators will simply pass the cost on to clients with a 10% increase in subscription rates.